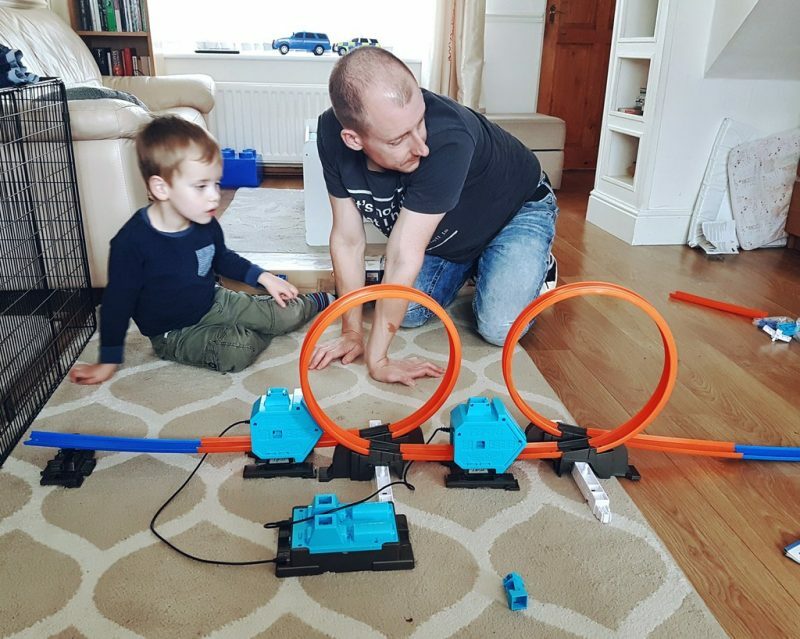 We were recently contacted by Mattel in order to try out their awesome Hot Wheels Track Builder System – Power Booster Kit. Although Biggest doesn’t like many traditional toys, I knew he would be fascinated by this one. Since he was very small he has been obsessed with all things transport-related – particularly in reference to the ways they move. The Hot Wheels Track Builder System Power Booster Kit is a set of tracks that allow certain Hot Wheels vehicles to do amazing stunts. 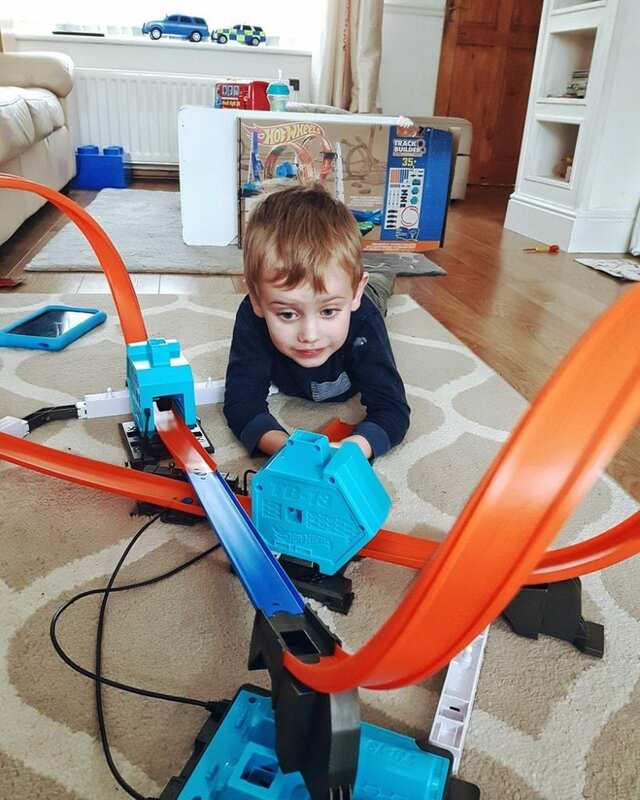 The battery-powered booster propels the cars around the tracks at extraordinary speeds, meaning they can achieve all kinds of spectacular turns, banking and loops. 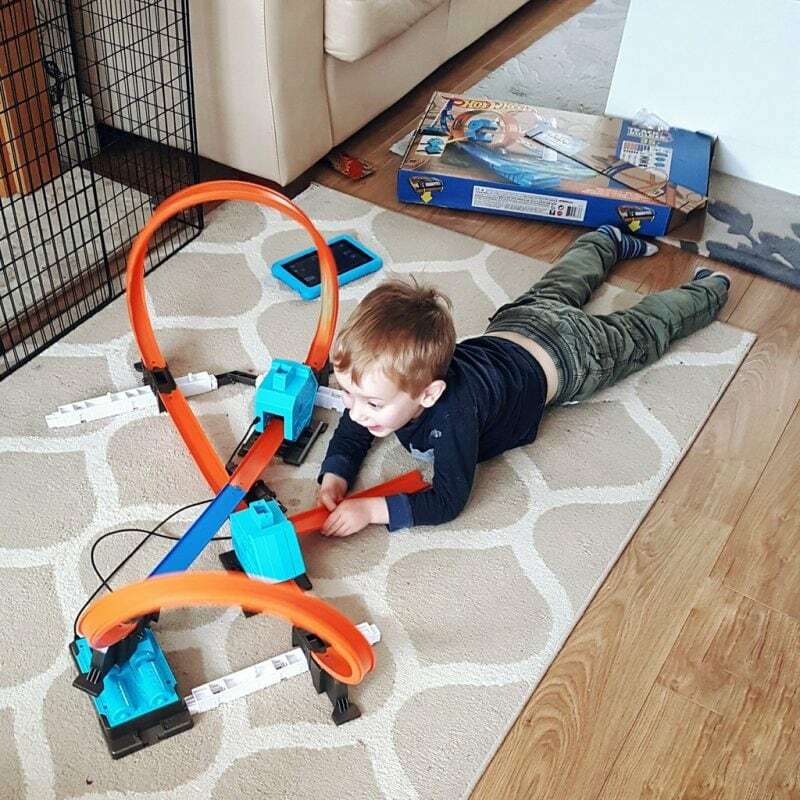 My son was far too little to put the track together himself. However, I imagine it is something that older children would find to be a thrilling part of the process. There are different combinations and different loops and twirls to configure, meaning you can build a unique track every time. My husband confirmed that it was the kind of toy that he and his brother would have spent hours rearranging as boys. In addition, my husband was also a huge fan. He was effusive about how it brought back the very best memories of his favourite presents as a child – well-built, technological toys that offered the exhilarating opportunity of experimentation. I know the feeling he is describing well. It is that unforgettable moment, on a birthday or Christmas, when you get a toy that feels truly magical. It is a feeling you remember long into adulthood. 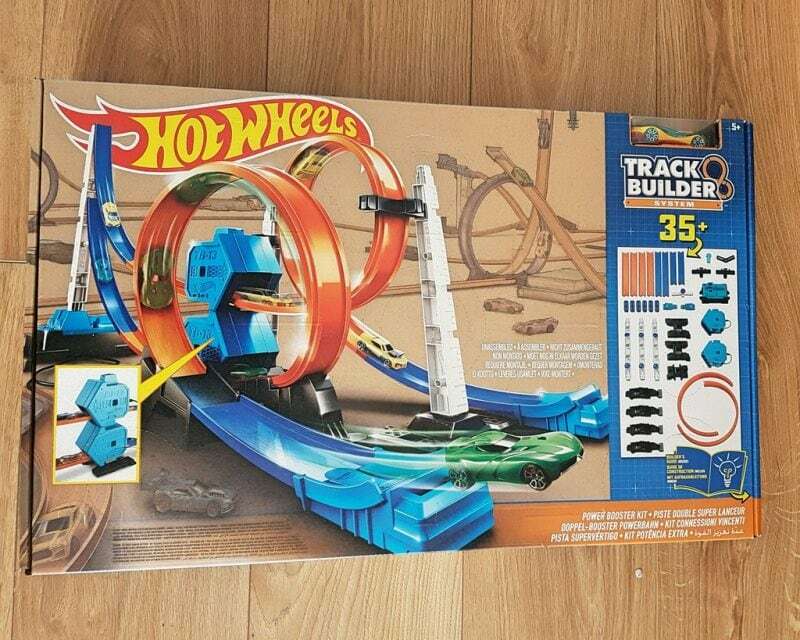 If you have a child who is interested in cars or technological and construction toys in any way, I can’t see how the Hot Wheels Track Builder System Power Booster kit could fail to be a huge hit. In addition to all the excellent positive attributes detailed above, it also has the wonderful potential for expansion. The many track pieces and tracks can be rearranged and added to. My husband’s suggestion? The Hot Wheels Fling-a-ma-jig. I fully expect Mattel to implement this re-branding at their earliest convenience. 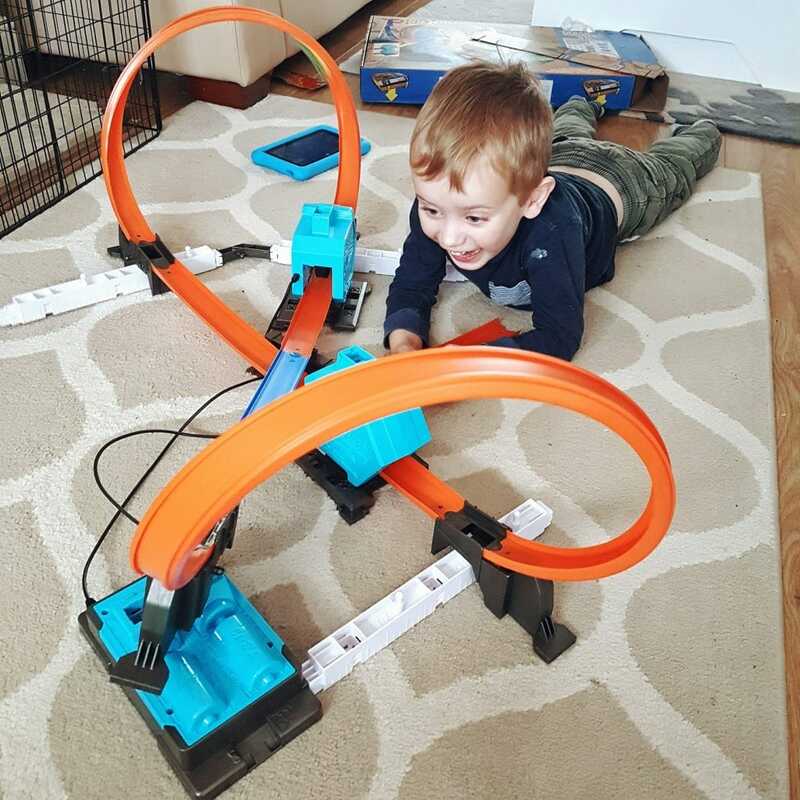 One lucky reader can win their very own Hot Wheels Track Builder System Power Booster Kit. To enter, simply follow the instructions on the Rafflecopter below. You should also take note of the terms and conditions there. Good luck! Thanks for the giveaway, I’ve entered and am keeping my fingers crossed, that would be an easy Christmas present sorted! My little girl has been after one of these for ages since trying it at a friend’s house. Like your boy, mine has shown a natural affinity for anything transport related so would definitely grow into this. Great review, I shall certainly look to get one even if I don’t win.